Wiggly babies, giggly babies. Babies on a swing. Babies on a lap. 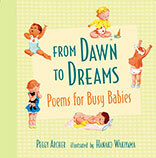 All kinds of babies keeping busy, busy, busy in simple poems by Peggy Archer and sunny, nostalgic images by Hanako Wakiyama. Simple rhymes — for anytime — engage babies and toddlers in this gift to treasure. 32 / 9" x 9"
Peggy Archer lives in Valparaiso, Indiana. Hanako Wakiyama is the illustrator of Goldie Locks Has Chicken Pox, Little Bo Peep Can't Get to Sleep, The Best Pet of All, and When it's the Last Day of School. She lives in Laguna Niguel, California.